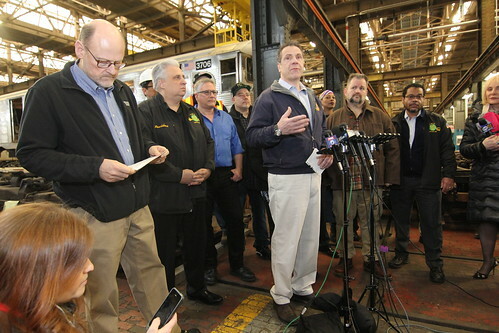 Governor Andrew M. Cuomo today toured MTA New York City Transit's 207th Street Car Overhaul Shop with MTA Chairman Joseph Lhota and announced a series of accelerated car repairs associated with the full funding of the Subway Action Plan. The 207th Street Overhaul Shop along with the system's other overhaul shop in Coney Island will now fully rehabilitate more than 1,300 cars a year - nearly 40 percent more than previous years. The full funding secured in the FY 2019 state budget will allow New York City Transit to significantly enhance the number of workers hired as part of the Subway Action Plan and allow the MTA's car overhaul shops to be fully staffed 24 hours a day, seven days a week. "The subway system is the lifeblood of New York City, and the newly fully funded Subway Action Plan is essential to deliver a mass transit system of the caliber that New York's economy and people require and deserve," Governor Cuomo said. "Enhancing the reliability of subway cars leads to fewer delays and better performance for riders, and we are determined to further modernize the system quicker than had ever previously been thought possible." Full funding allows the MTA to dedicate additional repair crews to specific car classes including the R46 and the R142A. On the 750 R46 cars, the MTA will focus on the repair and rehabilitation of the master controllers and voltage converters. For the R142A's, the new intensive focus will be on door monitoring control units. The intensive car rehabilitation efforts include a focus on subway car doors - the most problematic element of the cars - which are the most likely to lead to delays. New York City Subway car doors open and close 7 million times a day across the system. The increased staffing associated with the full funding of the Subway Action Plan will allow New York City Transit to continue to focus on the repair, replacement and testing of key door components to stop car-related delays before they start. The overhaul shops are also using increased staffing to ramp up HVAC (air conditioning and heating) repairs which is especially critical for the summer. The MTA will strategically deploy staff ahead of the summer to accelerate preventive air conditioning maintenance and then during the summer will redeploy that staff to address emergency air conditioning repairs 24 hours a day, seven days a week. "The MTA's new leadership team was challenged with stabilizing a system that had dealt with decades of deferred maintenance and neglect - and with the full funding of the Subway Action Plan we will be able to accomplish that mission," said Chairman Joe Lhota. TWU International President John Samuelsen said, "This is part of the system the public never sees: the car barns and overhaul shops where thousands of transit workers spend their working lives. The work that goes on behind the scenes is absolutely critical to restoring reliability. Gov. Cuomo took ownership of the problem and what needed to be done. He showed true leadership where others tried to duck and run." Tony Utano, President of TWU Local 100, said, "Subway trains carry so many riders, and travel so many miles in service, they really take a beating. We will now have more workers doing more inspections and repairs. The trains will be more reliable. It's fairly simple but also hugely important. Gov. Cuomo deserves a lot of credit for not only providing half the funding but also for ensuring the city met its responsibility." The comprehensive $836 million MTA Subway Action Plan will address system failures, breakdowns, delays and deteriorating customer service, and position the system for future modernization. The FY 2019 Budget fully funds the Subway Action Plan to move forward on these critically needed repairs, with the City required to contribute half of the funding for the plan. The MTA will begin receiving the funding in April and will receive the full funding by the end of 2018.